Happy 100th Birthday Mrs. Child! This is a bitter-sweet time of my life right now. I have learned so much and challenged my cooking talents onto places I never thought I could conquer. I am so honored to celebrate such a special occasion in History. I will never forget the last 100 days. The last week of #JC100 is deemed to go out with a bang. I have made this dish before for family and have gotten rave reviews. This is a dish I most enjoy doing. It takes a lot of work, time and steps and that is what I enjoy (believe it or not). Flavors develop and blend together. Simple ingredients transform into the deepest and richest taste. I could eat this everyday, but I don’t because how much of a treat would that be? 1) Cut bacon into 1/4 inch thick pieces. Simmer bacon for 10 minutes in water. Drain and pat dry. Meanwhile, pre-heat oven to 450 degrees. 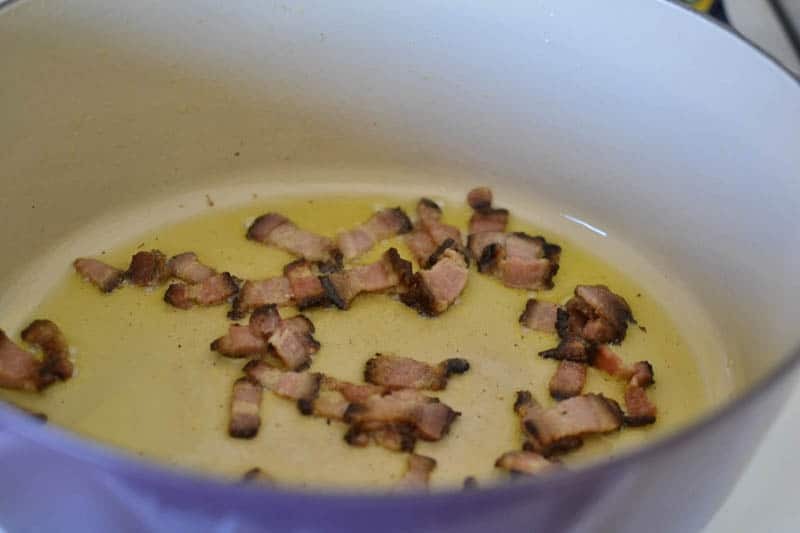 2) In a large casserole pot, saute bacon in olive oil on moderate hear for about 2-3 minutes to brown lightly. When ready, reserve bacon to a side dish. 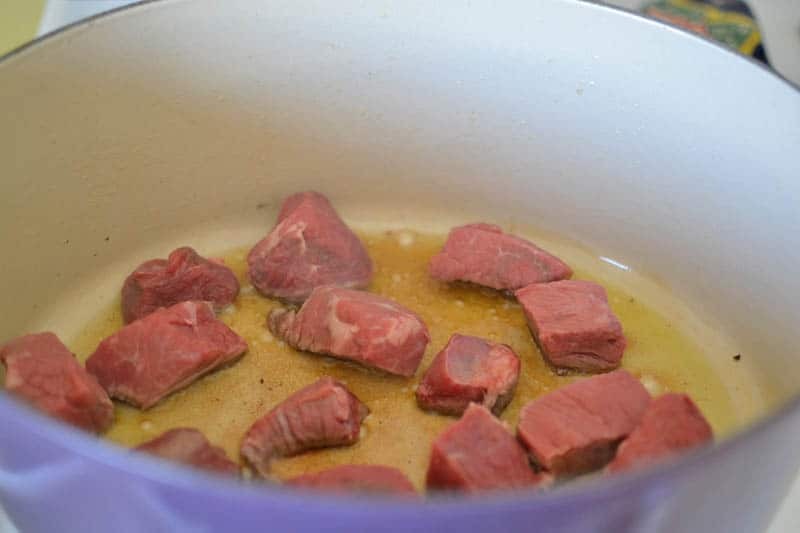 3) Pat dry the cubed beef with paper towels and brown in olive oil in the same pot. Brown on all sides. Only do one layer at a time, so don’t overcrowd the pot. Reserve meat to a plate when done. 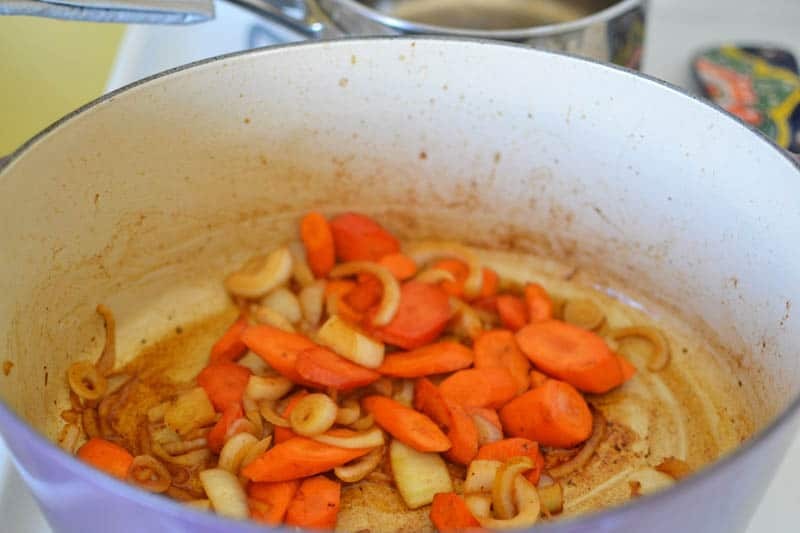 4) In the same pot, add the carrots and sliced onions and saute until lightly browned. About 5 minutes. 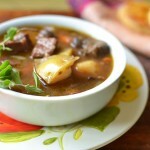 5) Return the beef and bacon to casserole pot and add salt and pepper, toss to coat. Sprinkle 2 Tb flour and toss to coat the beef all together. Next, place casserole uncovered in middle rack of oven for 4 minutes. Then toss the meat and return to oven for another 4 minutes. Julia insists that this step browns the meat). Remove casserole from oven and turn down to 350 degrees. 6) Stir 2-3 cups of red wine (I used Chianti) and enough beef stock to barely cover meat. Add tomato paste, garlic and herbs. Bring to a simmer on the stove top then cover and place back in oven for 2-21/2 hours or until meat is tender to forks touch. 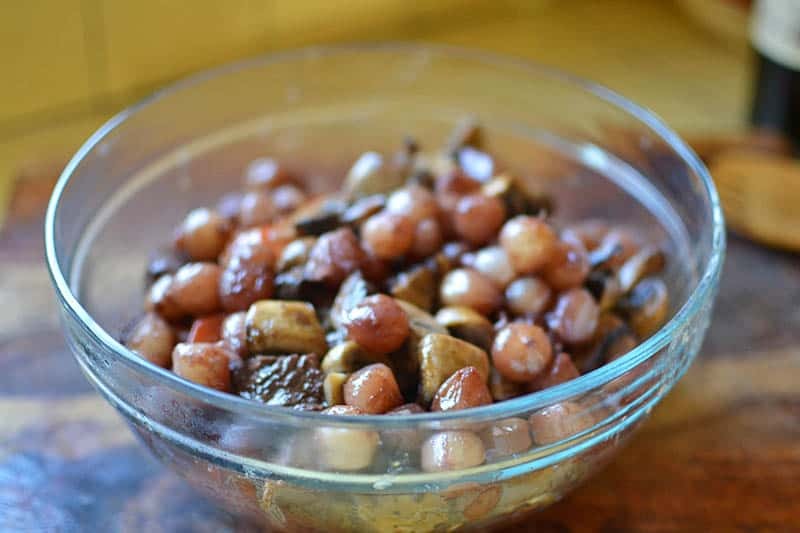 7) While the beef is cooking, prepare the onions and mushrooms. Set them aside until needed. 8) For the onions, allow the butter and oil to bubble in a skillet and add the onions. 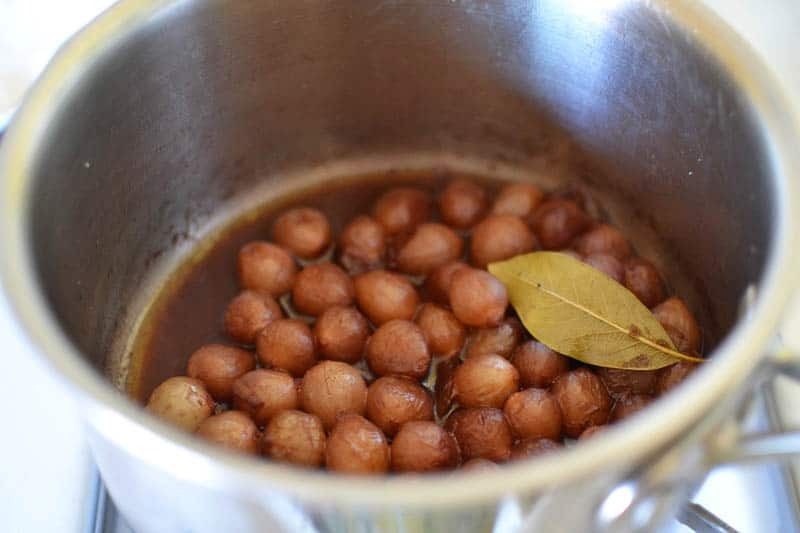 Saute for about 10 minutes on moderate heat so they begin to brown. Add stock, wine and herb bouquet and and slowly cook for 40-50 minutes until onions are tender and liquid has evaporated (for the most part). 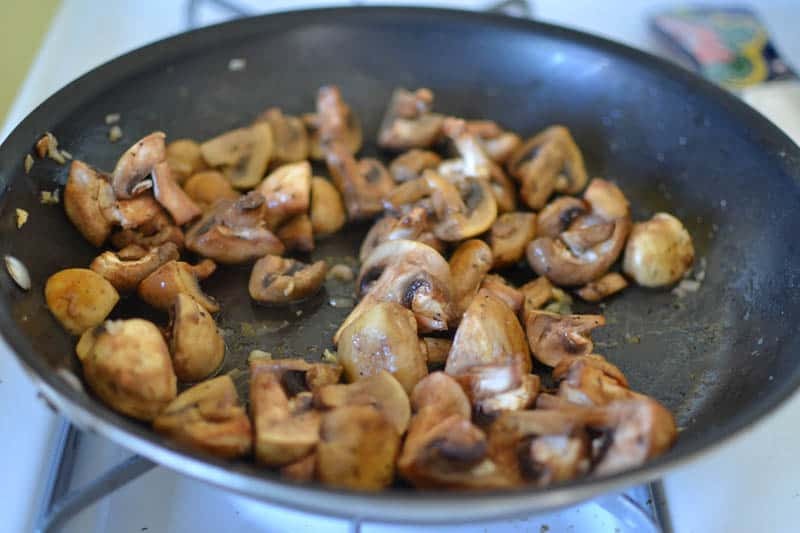 9) For the mushrooms, in a separate skillet saute mushrooms in oil and butter until lightly browned. 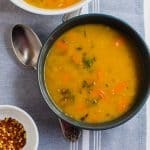 10) When the meat is tender, use a slotted spoon and remove all the meat and vegetables leaving just the liquid in the pot. On the stove-top turn heat on high and reduce sauce. 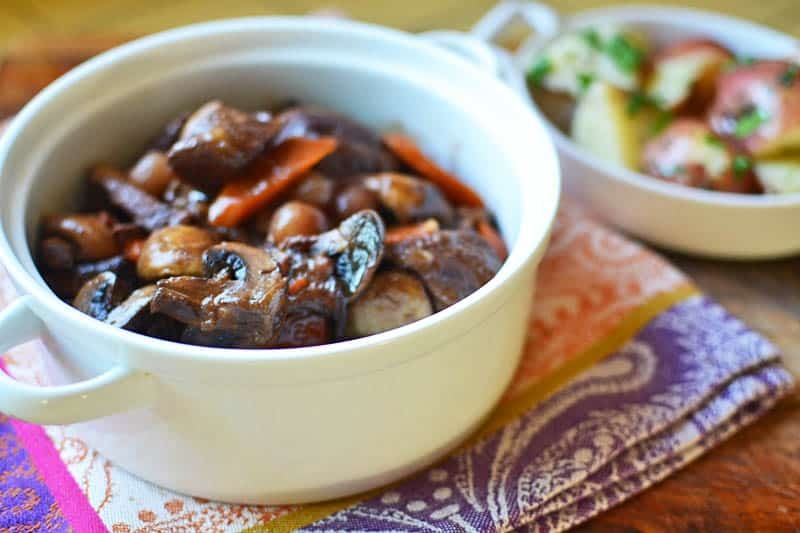 Once reduced add back meat, vegetables and braised onions and mushrooms. 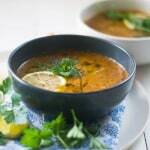 11) Serve with boiled potatoes and garnish with fresh parsley. 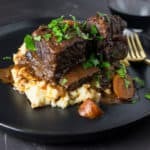 Julia Child’s 100th Birthday Giveaway! Well we can’t have a Birthday party without some presents..right? Award winning book author, Susanna Reich has just written the most adorable children’s book to celebrate Julia Child’s 100th Birthday. I had the pleasure of exchanging emails with Susanna and she has been blessed to have met Julia Child on her 80th Birthday. 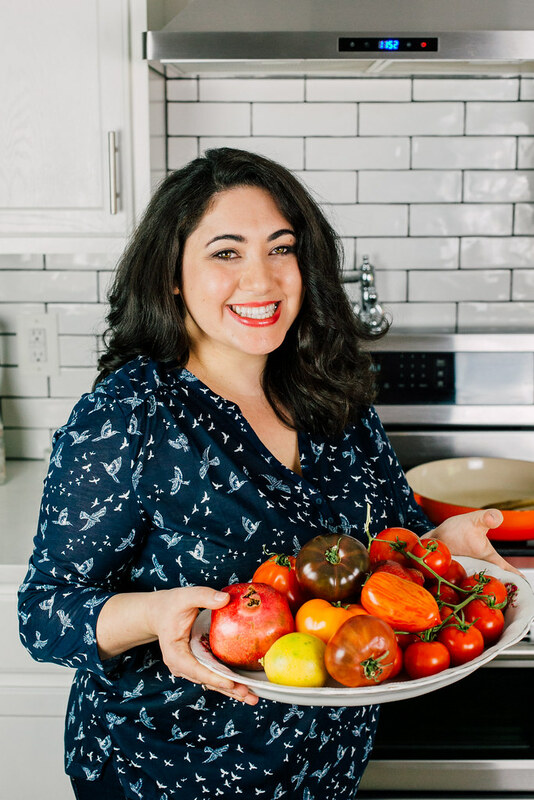 Being a lifelong Julia Child fan, Susanna has always wanted to write a book about the beloved chef and when she found out that Julia Child had a cat, well…Minette’s Feast was born. This book is absolutely breath taking. I read the children book and couldn’t stop beaming from ear to ear. Lovely illustrations of Julia’s life in France and her beloved cat, Minette who would rather enjoy mice than home made treats. This is a treat for both children, adults and anyone who is an avid lover of Julia Child. The publishers of Minette’s Feast are offering a copy of this lovely book to one lucky reader. 1) Leave a comment telling me why you love Julia Child. What is your favorite dish or your favorite quote/moment? Terms & Conditions:This is open to U.S. residents only. 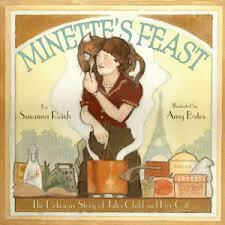 I was provided with a copy of Minette’s Feast. All opinions are my own. Please be sure to include your e-mail address or twitter name so that I can contact you if you win. The giveaway will run until Monday, August 20 at 11:59pm PST. The winner will be chosen at random using random.org from all eligible entries. Each reader has up to five chances to win. The winner will be notified through e-mail or direct message on twitter on Tuesday, August 21, 2012. Cut bacon into 1/4 inch thick pieces. Simmer bacon for 10 minutes in water. Drain and pat dry. Meanwhile, pre-heat oven to 450 degrees. In a large casserole pot, saute bacon in olive oil on moderate hear for about 2-3 minutes to brown lightly. When ready, reserve bacon to a side dish. 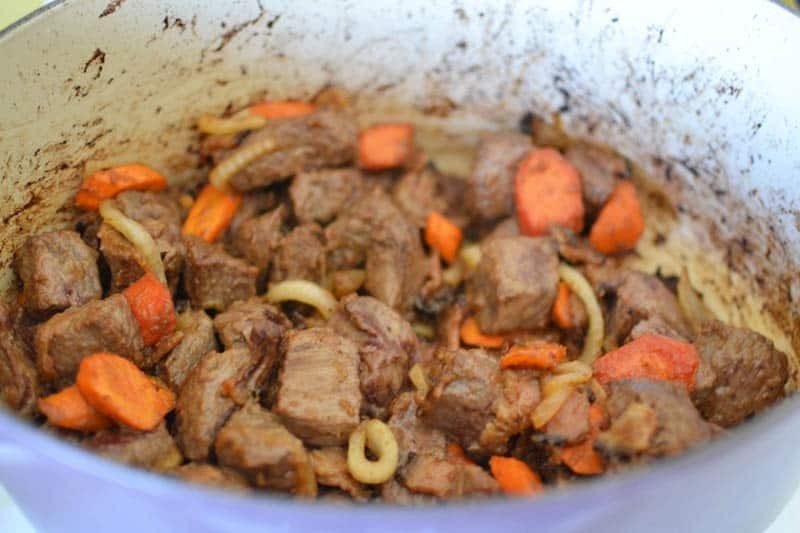 Pat dry the cubed beef with paper towels and brown in olive oil in the same pot. Brown on all sides. Only do one layer at a time, so don't overcrowd the pot. Reserve meat to a plate when done. In the same pot, add the carrots and sliced onions and saute until lightly browned. About 5 minutes. Return the beef and bacon to casserole pot and add salt and pepper, toss to coat. Sprinkle 2 Tb flour and toss to coat the beef all together. Next, place casserole uncovered in middle rack of oven for 4 minutes. Then toss the meat and return to oven for another 4 minutes. Julia insists that this step browns the meat). 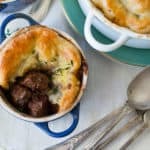 Remove casserole from oven and turn down to 350 degrees. Stir 2-3 cups of red wine (I used Chianti) and enough beef stock to barely cover meat. Add tomato paste, garlic and herbs. Bring to a simmer on the stove top then cover and place back in oven for 2-21/2 hours or until meat is tender to forks touch. For the onions, allow the butter and oil to bubble in a skillet and add the onions. Saute for about 10 minutes on moderate heat so they begin to brown. Add stock, wine and herb bouquet and and slowly cook for 40-50 minutes until onions are tender and liquid has evaporated (for the most part). For the mushrooms, in a separate skillet saute mushrooms in oil and butter until lightly browned. 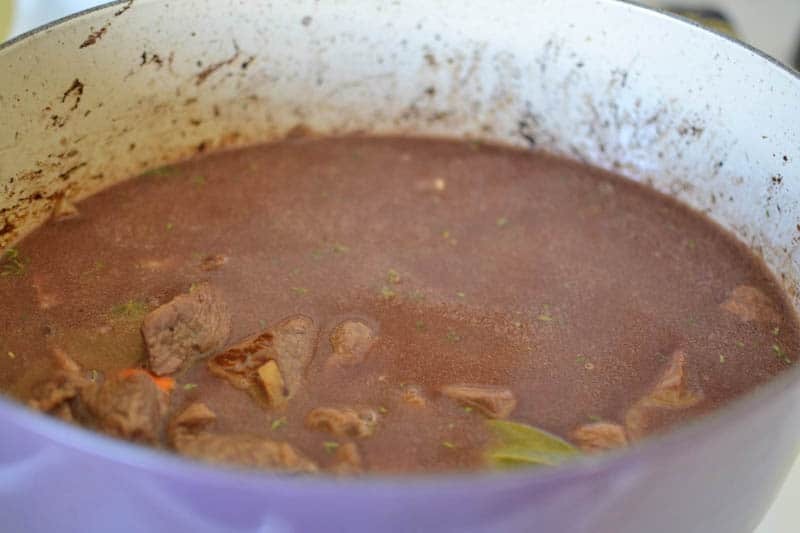 When the meat is tender, use a slotted spoon and remove all the meat and vegetables leaving just the liquid in the pot. On the stove-top turn heat on high and reduce sauce. 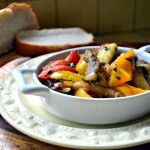 Once reduced add back meat, vegetables and braised onions and mushrooms. 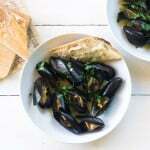 Serve with boiled potatoes and garnish with fresh parsley. 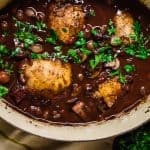 For more Julia Child favorites, try her traditional coq au vin recipe! I’ve never attempted this dish but her tomato sauce is a favorite at our house. This dish is absolutely beautiful, Sam! Perfect, even. I would love to dig right in. Yum! My favorite Julia dish is her chocolate mousse. It’s beyond delicious. Julia was such a frank, humorous woman Strong and savvy. I loved her recipe for a chocolate cake with a caramel dome. FAB! I was introduced to Julia Child through the movie “Julie & Julia” (which I have watching over 50 times). I haven’t cooked my way through the whole collection of recipes in “Mastering the Art of French Cooking” but she did bring me back to cooking and now I am obsessed with her cookbooks & DVDs. 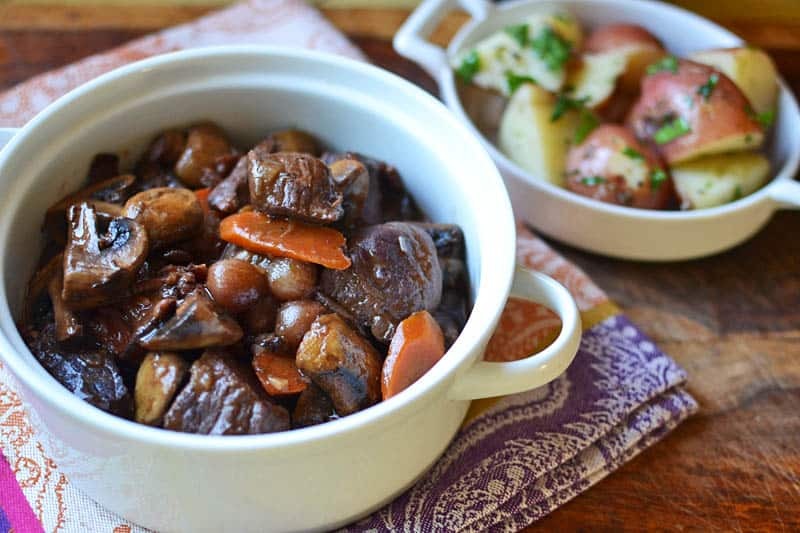 I cooked Scalloped Potatoes with Heavy Cream and Cheese and my son asks or it weekly….I made Boeuf Bourguignon last winter and can’t wait to do it again. This morning I am making an amazing omelet for my husband and a poached egg for myself (Julia taught me how to poach eggs in her DVD series “The Way to Cook”. Thank you, Julia, for bringing me back to cooking. I forgot how much it relaxes me and how much I love it! I loved watching Julia on PBS as a child. Always made me smile and helped me learn to love to cook! Hi Manda! 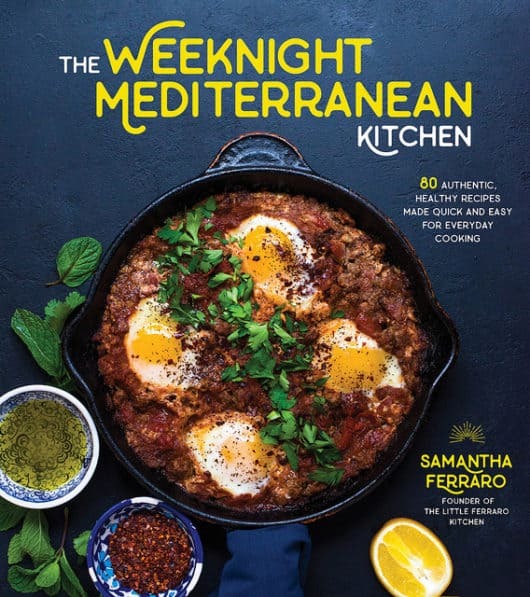 Can you please check your email and email me back ferrarokitchen @ gmail.com You won the book! Thank you! What is not to love about Julia Child. She loved and enjoyed cooking and shared it with all of us. I too, after watching Julie and Julia, a gazillion times weekly, started Cooking again. Have to say, so fat, her Beouf Bourguignon has turned out the best. Thank you and Bon Apetite!! 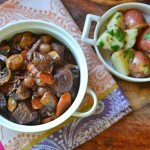 I just made Julia’s boeuf bourguignon again a couple weeks ago (and took that opportunity to change the old photo in the blog post!). Yours looks delicious. Funny about Julia’s last cat – when I was on the phone with her assistant the day after Julia died, she asked me if I wanted to take Julia’s cat! I couldn’t, but she went to a good home! I love Julia because she was funny and could easily laugh at herself. Have fun Karla and please let me know how it goes! !